Jillene Sturgess is aging out of Mandarins after marching nine seasons with the corps. 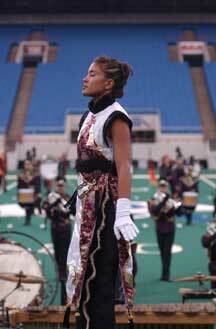 Her first season was 1994, when the corps had only 35 members (and ten in the horn line). She picked up a baritone because the corps needed horn players, and spent seven years on the instrument.^She spent one year in the guard, prior to taking off a year for summer school last year. (She had to make up some credits after changing her major to biological science.) She came back to age out this year as drum major. Jillene's older sister Shannon marched as drum major in 1993 and 1994, then came back in 1997 and 1998, aging out as a baritone player. Her younger sister Jessica has been in the corps seven years. She started in the pit and now also plays baritone. Her dad goes on tour with the corps, carting water bottles. He is an elementary band teacher and gave his kids a solid musical foundation. Jillene says that much of what Mandarins stand for today can be traced to its heritage. "The corps was founded 40 years ago as Yewah Drum and Bell Corps, an outlet for the local Chinese community to come together. It brought a lot of families in and the alumni have gone on to provide much support. "Before, the corps used to be mostly Asian-based. Now it's more diverse. We had to look elsewhere for more people, and reached out to more cities. Only about 20 percent of the corps is now Asian-American, but the Asian-American values are still the same. Our show is tied in with that heritage. "I used to think it was crazy for someone to be in the corps for so long, as it's such a huge time commitment. The years flew by and I didn't realize how long I had been in. I've been a part of it for so long that I knew if I didn't do my last year I'd have regrets." "I remember that at the Division III World Championship finals in 1998, I saw my older sister standing next to me in the retreat arc. She had this look of satisfaction that something was completed. It made me feel good to have a chance to march with her and it made the season that much more enjoyable. "Still, I'm kind of scared about not having anything to do next summer. I'll probably finish up my education. Even now at shows, the feeling of it slipping away is overwhelming. Sometimes I get teary-eyed looking at stadiums, realizing I won't be able to march anymore. "This year, the stories of each person in the corps came flooding back. I'll remember a story from years ago when I look at someone and I'll get this overwhelming adrenaline rush. I take a deep breath and realize I have no regrets for giving as much time as I have to the corps, that all my years were spent doing something I enjoy. "I'm sure I'll take the memories with me for a very long time. I learn something new from each and every person in the corps. It's a non-stop learning process."